Enough of the Lobster Salad roll vs. Warm Lobster roll debate. After all, when dining on whole steamed lobster, only a land lubber would first chill the meat, lather it in mayo, and sprinkle on some celery. Whole lobster is best devoured warm and buttery. Just like a Connecticut Lobster Roll. Our state lays claim to the warm lobster roll because it was first created at a Milford café named Perry’s sometime in the twenties. Elsewhere in New England, warm lobster rolls are rarely served. 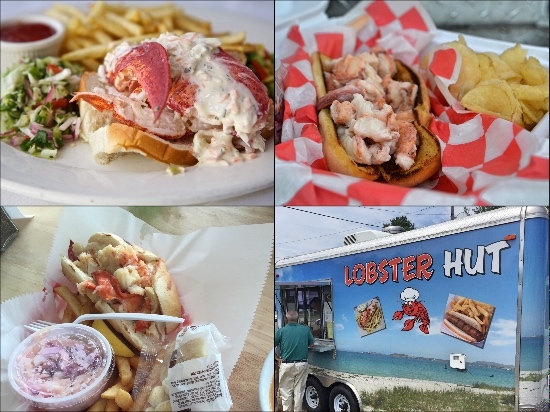 Since 2014 CTbites has celebrated summer with a survey of Connecticut Lobster Rolls available along the shoreline. We stand by our past evaluations since those versions of rolls remain relatively consistent from year to year. After all, the three simple ingredients of a warm lobster roll -- bread, butter, and meat – never change. Such variables as doneness, toppings, and cuts are not an issue. So for 2016, at the suggestion of readers, chefs, and staff, we add a dozen new restaurants, trucks, and drive-ins to the 2015 portfolio. This list represents the NEW additions. 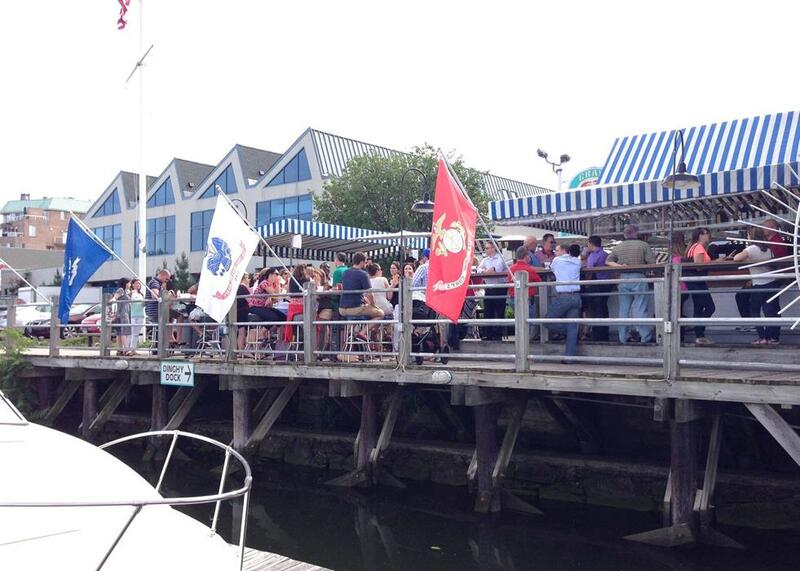 This extensive dockside complex probably sells more lobster rolls than any other seafood restaurant in the state. “It’s certainly the most popular item on the lunch menu,” our waiter said, estimating that Crab Shell probably serves over 10,000 a year. For good reason. Theirs is a classical lobster roll, constructed with fresh, simple ingredients. The kitchen poaches the meat in butter, then mounds five or so ounces of tail, knuckle and claw into a buttered top cut bun. The smooth meat texture plays perfectly with the crunchy roll, both lightly bathed, not drenched, in butter. We would have liked a bit more bulk to the bun, but that’s a quibble. Our group ate inside because of a windy sunset, but it was easy to imagine dining on the sun splashed patio at lunch, biting into Crab Shell’s glistening lobster roll, as gulls wheeled over the water. Can there be a finer summer lunch on the shore? At almost thirty dollars, Elm Street’s lobster roll is by far the most expensive we were served. The meat is freshly picked, and then nearly whole sections of claws and tail are piled in a delicious bun, flanked by fries, slaw, and salad. The meat comes lightly buttered, as well as the toasted bun. However, we like smaller chunks of meat, ready to chew. We found the lobster roll only slightly better than others at half the price. We also found, protruding from the claw meat, a cracked fan of apodeme, the translucent cartilage that serves as an attachment site for the crusher and pincher muscles. Broken, it’s a sharp dagger. Dangerous close to the roof of your mouth, even more so down your throat. We didn’t finish the roll. Elm Street Oyster is located just off Greenwich Avenue, in the heart of downtown. It’s a lot about the view. See and be seen. Many readers recommended this food truck, and when we arrived there was a long line. The price for the lobster is one of the lowest in the region -- $16. After placing the order, we waited about five minutes for the roll, and took a hot dog bun bulging with buttered lobster pieces to a picnic table splashed with sun. This, we thought, could be outstanding. The CLR was excellent, but not great. Meat, butter, and bun were in proper proportion, but the lobster was way too hot, as if overheated. That said, the value can’t be disputed. For the money, the Lobster Hut CLR is hard to beat. Incidentally, the truck is easy to miss on busy Bridgeport Avenue. A good landmark is the Land Rover dealership directly across the street. Ample parking. This colorful seafood shack, replete with Pirate trappings, flanks the Sound. However, its close quarters and parking lot are far too small to accommodate the crowds who flock there for lunch on a Friday afternoon in summer. I resorted to parking on the shoulder of the two lane street, engine running, while my wing-man ran in to order takeout. Fifteen minutes later my buccaneer finally emerged from the Jolly Roger festooned shack, bearing sweet plunder. We found a side street and ate from a paper boat, also part of the pirate theme. The four ounces of lobster were fresh, the bun crunchy, but the meat was diced a bit too finely for my taste. Its texture wasn’t as toothsome as the chunkier version. Otherwise, the lobster roll was delicious. Baldanza qualifies as a hidden gem, with the emphasis on “hidden.” Tucked down a passageway off Elm Street in the heart of New Canaan, the intimate 30-seat locavore cafe focuses its menu on sustainability and responsible sourcing. Their lobster is pulled from the waters off Little Cranberry Island in Maine where the fishermen return any females with eggs back to the ocean. The brioche rolls were inspired by a small bakery which owners Sandy and Angela Baldanza discovered in Kennebunkport. The meat is freshly picked from a small lobster. Their sandwich offers a nice balance of Wave Hill bun, Cranberry Island lobster meat, and local butter. But what about those white drops lightly sprinkled throughout the roll? We discovered they were dots of tartar sauce, which added another accent of brine to this succulent seafood sandwich. And thus a bit of mayo sneaks past the buttery borders of a traditional Connecticut Lobster Roll. We found a place to sit outside and dug in. The first bite was excellent. Even though re-warmed, the lobster meat (claws, knuckles, and tail) was not rubbery and retained a sweetness as if it had just been cooked. My second bite was not as good. A chunk of pink coral (cooked lobster roe) had found its way into the sandwich. Though some people regard coral as a delicacy, I don't. I find its texture and taste flat, not as sweet and luscious on the palate as the glistening, supple flesh meat. I picked another chunk of coral from the meat mound, and then devoured the rest of what was otherwise a sumptuous sandwich. The chalkboard menu on the wall looked promising. Imaginative. 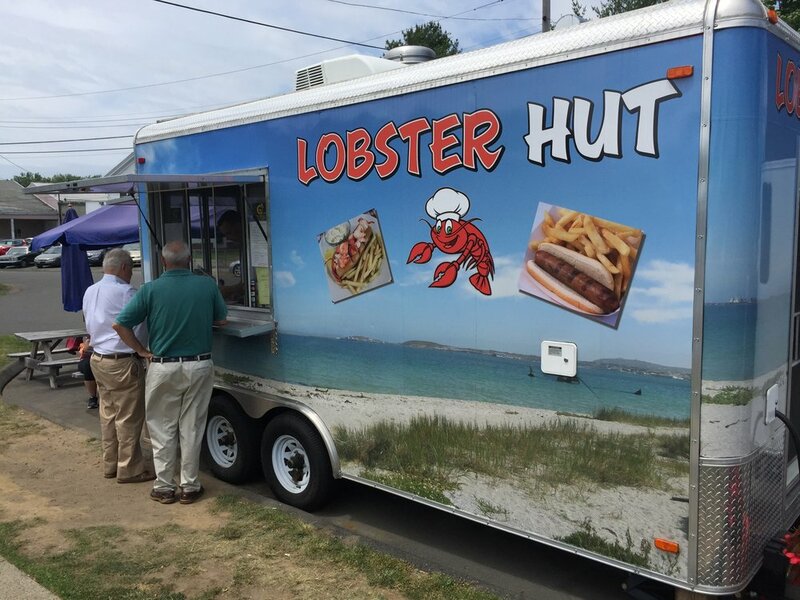 It listed versions on the classic Lobster roll, like a Mango Salsa Cilantro lobster, an Avocado version, or “The Noah,” made with dairy free butter and a gluten–free roll. So instead of “The Original,” we opted for a Roasted Garlic Maine lobster roll. And for starters, a lobster bisque. The soup came first. Creamy, deeply flavored, and generous, the bisque seemed an auspicious scene setter for a roll with a riff. Which arrived with fries and slaw. We dug in. After a bite or two, I looked at my friend. “I don’t taste the roasted garlic,” I said. “Do you?” He shook his head. “But it’s really good.” We shrugged and returned to eating. The quarter pound of sautéed buttery meat was tasty, and it rocked in the roll. A pure, simple classic. Nothing better. The roasted garlic garnish or the mango-cilantro salsa dressing would have been just a distraction. Lobster Post is relatively new to the CLR scene. This is their third summer in business. “Lobster Rolls are Back,” proclaims a big sign in front of Danny’s Drive In. Translation: Summer in Stratford is officially here. Danny’s has been a roadside institution since 1935, starting as a year-round burger and hot dog stand. Lobster rolls are seasonal, served only during the warm months. Claws and knuckles from a 100% fresh picked Canadian lobster are stuffed inside a small toasted New England roll, and served with lemon and a side of warmed drawn butter, so the meat can be sauced to personal preference. Danny’s is a solid, classical no frills CLR. The stuff of summer. We liked that it doesn’t include tail meat, as did most of the other rolls in this survey. Fibrous tail can be a bit too chewy for a sandwich, lacking the moist, smooth bite of knuckles and claw flesh. As for the “Canadian” born lobster, we defy anyone to taste the difference between it and “Maine” lobster, despite what Gordon Ramsey has to say on the matter. We do suspect that the Canadian Crustacean is less expensive, adding to Danny’s profit margin. The shack charges $22 for a small bun and four ounces of lobster. Down the road in Stratford, Knapp’s Landing serves a “King Lobster Roll” that boasts 50 percent more meat for $19.99. It sounded delicious. Buttery lobster on the restaurant’s famous house baked bread. Unfortunately, the sandwich did not live up to Off The Hook’s splendid reputation. The dense, crusted homemade bread was good, but far too robust for the soft textures that make a great a lobster roll. What’s more, the bun over-powered the lobster. As for the meat, it lay on the bread in a “sheet” of stringy, unseparated claw flesh which was over salted and tasted, well, funky. What auspices! The wonderful Rowayton Seafood runs the Market, and the building it occupies is a former lobster shack that was once the oldest operating lobster co-op on Long Island Sound. While their lobster roll did not disappoint, we expected more. We ordered at the counter and watched a cook in the galley prep the sandwich. He cracked and picked a quarter pound of meat and hand placed the pieces directly into a toasted roll. Butter and a lemon slice came on the side, along with crispy fries just out of the cooker. It doesn’t get more fresh than that. No fuss, no frills. We took our plate out to the deck overlooking the water and bit into the sandwich. Unfortunately, the small hot dog roll fell apart after the first bite. It couldn’t stand up to the buttery lobster. Otherwise, the sandwich was sweet, soft, simple, the very essence of a classic Connecticut Lobster Roll. A fishing boat passed the dock, and the captain waved. We held up the roll. The fisherman grinned and smacked his lips. “Best lobster roll ever,” he shouted. We wish we could whole heartedly agree.